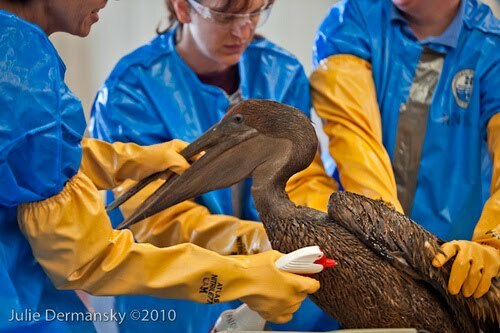 "SANCTUARY NEEDS DONATIONS for a possible impact on Florida's beaches from the Gulf Oil Spill: The Suncoast Seabird Sanctuary and Avian Hospital's trained staff is on stand-by to assist with the Gulf Oil Spill Crisis, with over 700 volunteers on call if needed. We are asking for more volunteers to be on emergency call. The sanctuary is the largest wild bird hospital in the U.S. based on the admission of over 8,000 injured birds each year. It is set up to immediately triage, stabilize and administer fluids to, malnourished, or injured birds. The Sanctuary has received thousand's of emails and calls from around the world from concerned groups and individuals. and has experienced avian care staff on standby to assist Tri-State Bird Rescue and Research. To report oiled wildlife affected by the Gulf oil spill please call the Wildlife reporting hotline at 1-866-557-1401."